Maybe someone else can answer this one for me, because I’m stumped and can’t seem to find the right search phrase to turn up relevant results in Google: I can’t get Excel to open a .csv file on my friend’s Mac. It runs OSX, and the “About Excel” dialog says “Excel X for Mac” (can you tell what a dummy I am when it comes to Mac? The only thing that saves me is the presence of the Terminal, so I can resort to the command line to do things). Both of us have tried all the ways we know. No matter what we do in the Open dialog, including choosing “All Readable Files,” it leaves CSV files grayed out. The only way we’ve found is to rename it to something else such as .txt, open the file, and then do Data->Text To Columns. 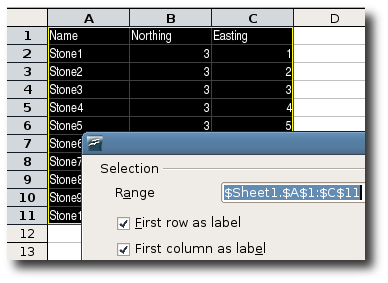 The first column in the spreadsheet is the point’s name. 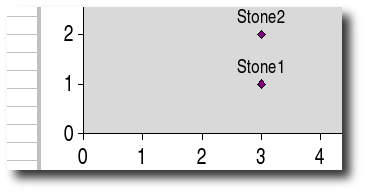 We tried and tried but couldn’t get Excel to plot the points with nice labels next to them. A bit of Googling revealed lots of other frustrated folks with the same problem. This has been a limitation in Excel for many years, and so many people want this feature, I wonder why they aren’t implementing it. The good news is, someone has written a little utility which will label XY scatter plots in Excel, both for PC and Mac (here’s another link). So it’s possible to do after all—just not easy, and not built-in. I probably would not have solved this on my own. The way to select and unselect charts, and how to modify their properties, is really unintuitive, I’m afraid. Even after fooling with charts a while, I’m still blundering through things like exactly what sequence of actions is necessary to make a chart editable, what I need to do to alter the scale on the axes, and so forth. Even if I had known all that in advance, though, I wouldn’t think to go to the Insert menu to add labels to the chart. I told it to do that when I created the chart—why doesn’t it show them by default? If I didn’t want them to show, I wouldn’t have specified the first column as labels. I conclude both Excel and OpenOffice.org both have some room for improvement. I’m sure that comes as no surprise! The good news is, OpenOffice.org is a community-driven effort, with an open bug-tracking system and active forums—not to mention it’s Free Software. You know who I’m backing… take ‘em to the mat!